There are two file recovery modes provided with the softwarei.e., Recover Exchange Server Private store database and Public store database file. The email metadata like To, Cc, Bcc, etc., and attachments all remains same after the conversion. Tool does not require any Exchange or Outlook environment for performing conversion and perform file migration without any prerequisites. It generates an instant preview of data, just after scanning the whole EDB file. This data is displayed on the center of the tool window. Tool converts a single as well as multiple emails from Exchange EDB file and archive them in MSG format. You just need to select all those mails that you want to save in MSG and then, tool will export selective mails in MSG. The utility export both types of EDB files into MSG file format i.e., Public and Private. With help of this product, you will be able to migrate Exchange database files even in absence of Exchange connection. If you are using Exchange on regular basis then, there are high chances of corruption in EDB file. Therefore, it is recommended to users that they should create duplicate copy of all Exchange emails by converting them into MSG. Sometimes, the server is having EDB files that are corrupt due to one or the other reason. In such case, if there is a need to access emails from file then, the best suited approach is to convert those mails in MSG and operate them on Outlook. The software is easily supported on all latest versions of Windows i.e., Windows 10 and below. Moreover, EDB file of any Exchange server is supported by this utility without any complications. You can straightaway use Free Version of the tool to load, scan and preview of EDB data, but the only obstacle in demo version is that you can't save Exchange data to MSG into the hard disk. I was having EDB file of around 3.10MB size with me. I searched a lot for the such utility that supports Exchange file of such size. 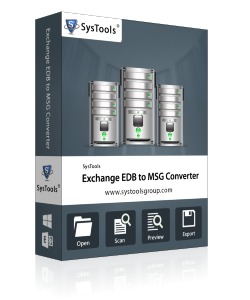 Suddenly, I came across your converter software which export EDB to MSG within few minutes. It supported file of this size without any error and within just few minutes I was able to get my emails converted in MSG file format. Copyright © 2007-2019 www.edbfilerecovery.org All Rights Reserved.